ColdFusion is a commercial rapid web application development platform invented by Jeremy Allaire and JJ Allaire in 1995. (The programming language used with that platform is also commonly called ColdFusion, though is more accurately known as CFML.) ColdFusion was originally designed to make it easier to connect simple HTML pages to a database. By Version 2 (1996), it had become a full platform that included an IDE in addition to a full scripting language. With the release of ColdFusion MX 6.0, the engine had been re-written in Java and supported its own runtime environment, which was easily replaced through its configuration options with the runtime environment from Sun. Version 6.1 included the ability to code and debug Shockwave Flash..
ColdFusion 11 has actually removed many features previously identified in earlier releases as "deprecated" or no longer supported. Usually you could continue to use a certain tag or function. This is no longer the case. For example, changes to the CFLOG tag that were deprecated will cause an error condition in CF11 and not in CF10. ColdFusion 12 (Codenamed: Raijin) is currently unreleased. It entered a closed beta testing stage in July 2015. Adobe haven't announced any new features or changes specific to this release yet. There is no confirmed release date, but a speculative date could be early 2016. On August 13, 2012 Adobe announced, via their Official ColdFusion Blog, the new Roadmap for ColdFusion including the code names, "Splendor", "Thunder" and "Dazzle", for the next two release versions. Adobe announced new features for ColdFusion including (but not limited to); Mobile - Streamlined Mobile Application Development, Revamped and new PDF functionalities, Enabling Enterprise to easily integrate with Social Media Streams, Enterprise mobility, Support for responsive multi screen content, Digital Marketing – Web, Mobile & Social Analytics and Customizable Enterprise Video Portal. Adobe also announced in the same Roadmap upcoming cloud enhancements. The Roadmap projects ColdFusion development out to the year 2021. ColdFusion Server includes a subset of its Macromedia Flex 1.5 technology. Its stated purpose is to allow for rich forms in HTML pages using CFML to generate Flash movies. These Flash forms can be used to implement rich internet applications, but with limited efficiency due to the ActionScript restrictions in place on Flash forms by Macromedia. Flash forms also provide additional widgets for data input, such as date pickers and data grids. ColdFusion also includes some XForms capability, and the ability to "skin" forms using XSLT. 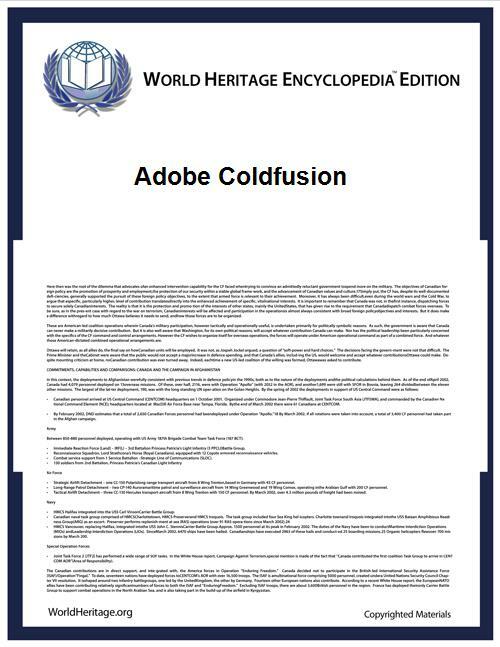 ColdFusion can generate PDF or FlashPaper documents using standard HTML (i.e. no additional coding is needed to generate documents for print). CFML authors place HTML and CSS within a pair of cfdocument tags and specify the desired format (FlashPaper or PDF). The generated document can then either be saved to disk or sent to the client's browser. ColdFusion 8 has now introduced the cfpdf tag which allows for unprecedented control over PDF documents including PDF forms, and merging of PDFs. These tags however do not use Adobe's PDF engine but a combination of the commercial JPedal Java PDF library and the free and open source Java library iText. ColdFusion was originally not an object-oriented programming language like PHP versions 3 and below. ColdFusion falls into the category of OO languages that do not support multiple inheritance (along with Java, Smalltalk, etc.). With the MX release (6+), ColdFusion introduced basic OO functionality with the component language construct which resembles classes in OO languages. Each component may contain any number of properties and methods. One component may also extend another (Inheritance). Components only support single inheritance. Object handling feature set and performance enhancing has occurred with subsequent releases. With the release of ColdFusion 8, Java-style interfaces are supported. ColdFusion components use the file extension cfc to differentiate them from ColdFusion templates (.cfm). A second way is the development of CFX tags using Java or C++. CFX tags are prefixed with "cfx_", for example "cfx_imap". Tags are added to the ColdFusion runtime environment using the ColdFusion administrator, where JAR or DLL files are registered as custom tags. Currently, alternative server platforms generally support ColdFusion 8 functionality, with minor changes or feature enhancements. ColdFusion 8 natively supports .NET within the CFML syntax. ColdFusion developers can simply call any .NET assembly without needing to recompile or alter the assemblies in any way. Data types are automatically translated between ColdFusion and .NET (example: .NET DataTable → ColdFusion Query). CFMX is the common abbreviation for ColdFusion versions 6 and 7 (aka ColdFusion MX). ColdFusion originated as proprietary technology based on Web technology industry standards. However, it is becoming a less closed technology through the availability of competing products. Products include Lucee, Railo, BlueDragon, IgniteFusion, SmithProject and Coral Web Builder. In April 2015 there was reported a Cross-site scripting (XSS) vulnerability in Adobe ColdFusion 10 before Update 16, and in ColdFusion 11 before Update 5, that allows remote attackers to inject arbitrary web script or HTML; but, it's exploitable only by users who have authenticated through the administration panel . ^ Consuming a Web Service in ASP.NET Tutorial. Digital Colony (2007-08-23). Retrieved on 2013-07-21. ^ Ben Forta - "Using the CFC Proxy"
^ "Adobe software vulnerabilities blamed for NIST NVD infection." ^ Adobe – Security Bulletins: APSB13-10 – Security update: Hotfix available for ColdFusion. Adobe.com. Retrieved on 2013-07-21. ^ "Security Advisory for ColdFusion"
^ "Security update: Hotfix available for ColdFusion"